At this time we have digitized The Daily Collegian for years 1887 to 2010. Microforms and Government Information and The Special Collections Libraries receive many questions and queries about these newspapers and their content. Until this project, researchers seeking to use these newspapers were largely limited to a microfilm collection located in Microforms and Government Information due to the very fragile condition of the bound volumes that are housed and preserved by The Special Collections Library. In the past, to find articles by subject, researchers had to use a card file started in the 1930's that is located in The Special Collections Library. This card file contains handwritten cards identifying articles about people and events deemed important at the time, but often omitted articles that researchers today might find interesting or important. 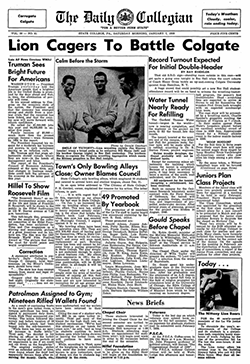 Today, the Historical Digital Collegian provides access to all words, photographs, and advertisements as well as an exact page image of the newspaper page containing the article. For those readers who prefer to see the newspaper intact, each issue can be browsed page-by-page. Thus, the Historical Digital Collegian allows researchers greater flexibility in locating articles of interest and in allowing greater access for those researchers not able to visit The University Libraries. The Historical Digital Collegian database was created from the microfilm copy. The result is a database of page images that can be browsed and searched. Funding was provided by the state through legislation requiring the four statewide Library Resource Centers to create online resources for the citizens of Pennsylvania. The project was coordinated by the University Libraries' Digitization and Preservation Department under the leadership of Sue Kellerman, The Judith O. Sieg Chair for Preservation, in consultation with William L. Joyce, Dorothy Foehr Huck Chair & Head, Special Collections Library, and Debora Cheney, Foster Communications Librarian & Head, News and Microforms and Social Sciences Libraries. We are very pleased to provide access to this important record of The Pennsylvania State University's history.